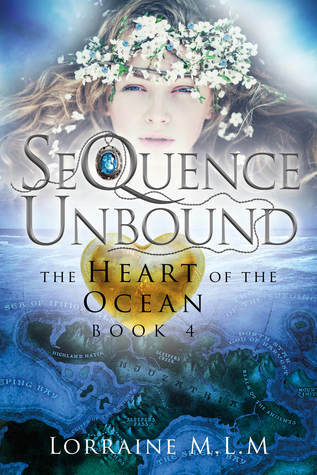 SeQuence Unbound (The Heart of the Ocean, #4) by Lorraine M.L.M. We’d love your help. Let us know what’s wrong with this preview of SeQuence Unbound by Lorraine M.L.M.. Preview — SeQuence Unbound by Lorraine M.L.M. When Alessia saves not only Tuscania, but Dante as well, she hopes it will set all the Sequences in order. But things rarely turn out the way Alessia hopes. Instead, she finds herself torn between two princes as the voices and visions in her head become stronger than ever. While Dante and Jadherey vie for her heart and her hand, a part of Tuscania's protective shield collap When Alessia saves not only Tuscania, but Dante as well, she hopes it will set all the Sequences in order. But things rarely turn out the way Alessia hopes. Instead, she finds herself torn between two princes as the voices and visions in her head become stronger than ever. While Dante and Jadherey vie for her heart and her hand, a part of Tuscania's protective shield collapses and it is attacked. The invaders have a proposition though—they’ll leave the realm intact if Alessia and her foretold mate are turned over to them in chains. With Alessia and Dante as their key, the Njuzathians plan to break open the gate to Earth and wreak havoc on two worlds at once. To ask other readers questions about SeQuence Unbound, please sign up. Review: So, this review is going to be short and to the point as I can’t discuss a lot of this book without giving away major spoilers for the series, but this is definitely the book where we get the answers we have wanted since book 1 and where the stakes are taken to completely new levels for all the characters not just Lessi. One of the first things I noticed with Unbound is we get several new perspectives that we haven’t seen in the books in this series and I was very excited with this and I wasn’t overly upset about losing a certain character’s perspective because after the last two books I had really gone off this character. One thing that I really enjoyed about Unbound was the motivations of all the characters and the different directions the character arcs go in. For example, Lessi’s character arc which had been building over the course of the previous 3 novels really takes a serious turn away from the romance and to the overall problems that her world is facing and how she develops as a person. In the previous 3 novels, I did feel that some of the characters felt a little flat, but this novel really fixed that. We know that Lessi, Jad and Dante have unique voices, flaws and virtues but we are introduced to more characters and you really flesh them out and one of the best is Jizu. Jizu is a morally ambiguous character but as we learn more about him as a man and a father it brings a degree of clarity to the history of this world which we haven’t had before. The main goal of this novel is very clear; to defeat the Sleepers. However, there are more goals for individual characters that really shine in Unbound that didn’t have the chance to shine in previous novels. While I won’t to into too much detail Jad’s journey was the one that really stood out to me and he was a character that I felt had so much wasted potential in the previous novels, but he fulfils that potential and more in Unbound. On the other side of this the antagonist’s motivation are also clear. The Sleepers want to be immortal but De-Deganon and Lavia’s motivations in this story also become apparent and it provides more than one external influence for the character to deal with. In the grand scheme of things this provided so much tension and suspense that it really keeps you hooked. I also found in the previous novels there was an issue with pacing and Unbound didn’t suffer with this. It felt fast paced in the action scenes and felt slow in places that were meant to draw you in and keep you hanging. While these books have focused a lot on the romance before this really takes a back seat for the majority of the novel which I was very happy with as it wasn’t overwhelming the reader to the bigger issues that the characters were facing but when it was used it was used in such a way that it felt fresh, new and added more to the story than taking it away. I haven’t talked much about what actually happens within the novel as it isn’t possible without spoiling this novel and the previous ones if you haven’t read them yet, but all I can say is Unbound was my favourite book in the series so far and it really took away any doubts I had from the previous three novels and I can’t wait for book 5 after the way this one ended. One thing I didn’t enjoy was the introduction of a certain characters as I felt that even though this character was needed, I didn’t like their personality and the way they acted in general, but I didn’t let that distract me from the characters that I did enjoy. I also wanted to see more of certain characters, but I am hoping I will have that in the next book. Very exciting never wanted to put it down. A lot of twists in the story. Some may surprise. I still root for Dante. It’s very hard to give a review without spoilers with this book. Can’t wait for book 5. Lorraine M.L.M grew up in the Heart of Africa among a rich storytelling tradition. This is where her love for Fantasy was born. She writes heartfelt young adult romantic fiction across various genres. Her love for reading prompted her passion for writing. She loves all genres of romance but has a special and inherent interest in Fantasy/Romance in particular uplifting and thought provoking fiction Lorraine M.L.M grew up in the Heart of Africa among a rich storytelling tradition. This is where her love for Fantasy was born. She writes heartfelt young adult romantic fiction across various genres. Her love for reading prompted her passion for writing. She loves all genres of romance but has a special and inherent interest in Fantasy/Romance in particular uplifting and thought provoking fiction. Lorraine lives with her family in the charming Norfolk city of Norwich in England.